Too many innocent people are dying from gun accidents, violent crime, and mass murder. There must be a balance between public health and safety and 2nd Amendment rights. In 2017, I wrote a guest commentary for the Arizona Daily Star and gave a couple of speeches on the topic of balanced public policy: Balancing Responsibility and Liberty: The Yin and Yang of Public Policy. Many people are frustrated with our government and believe that it does not work for them. Some say that the “system is rigged against them.” In my opinion, too many of our laws are written by special interest groups, and they may not represent the will of the public. 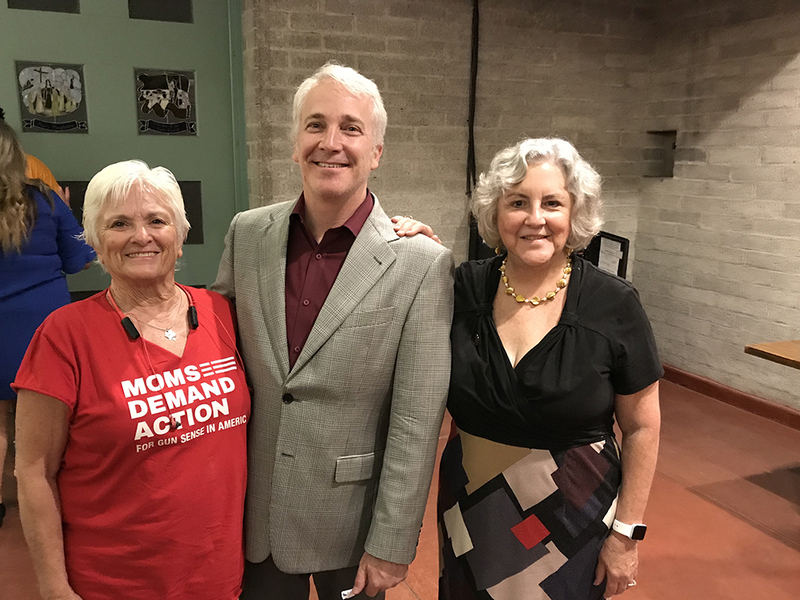 Here I am with two of the heroes of the January 8, 2011 Safeway shooting– Pat Maisch and Dr. Randy Friese after the Moms Demand Action Candidate Forum in 2018. Gun control legislation is a perfect example of laws that cater to special interest groups and particular industries, to the detriment of public health. 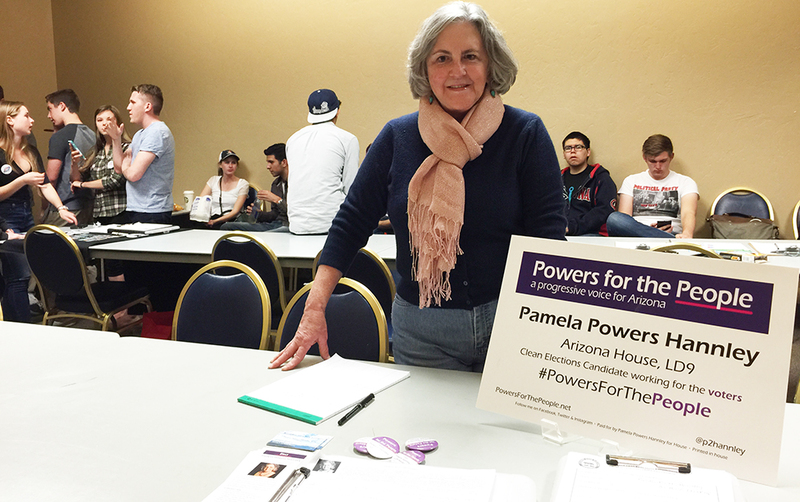 Congress has perpetually skirted meaningful gun reform, and nearly every bill that expands gun rights passes the Arizona Legislature. On Second Amendment, individual liberty is sacrosanct. Unfortunately, tipping the scales so heavily toward individualism (ie, gun rights) has made us less safe as a country. A recent CDC study looked at 10,000 homicides of women and found that half of these women were shot to death by their male partners. Along the same lines, recent research on violent death in 22 high-income countries revealed that 90% of the women who died a violent death were killed by a firearm in the US. And 80% of the children who died a violent death were killed by a firearm in the US. This is unacceptable. “… firearms are killing us rather than protecting us,” is what authors of the American Journal of Medicine article concluded. As a society, we need to find balance between the individual’s right to own a gun and the larger community’s right to safety. These mass murders, fatal traffic stops, and family tragedies must stop. We are better than this. I support the March for Our Lives and Moms Demand Action agendas. I received an A rating from March for Our Lives. I support banning bumpstocks and other similar devices, universal background checks, closing the gun show loophole, red flag or STOP orders, closing the boyfriend loophole, safe storage incentives, and revisiting the Assault Weapons Ban, the Brady Bill and other solid public health ideas out there. I am open to suggestions and dialogue. For example, I believe that promoting safe storage of weapons (locked and unloaded) is a simple way to prevent firearm-related accidents– particularly in homes with children. The level of gun violence in this country amounts to a public health crisis. It’s time that our weapons laws balanced individual liberty with social responsibility. Too many innocents are dying. For more on responsible gun ownership and gun violence prevention, check out these links and videos.